DAVAO CITY, Philippines (Mindanao Examiner / Apr. 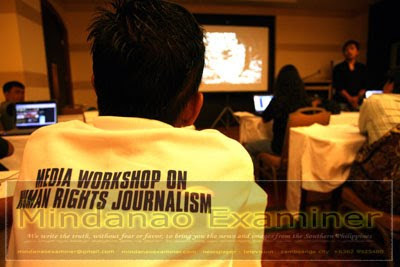 7, 2011) – Some two dozen Filipino journalists in Mindanao have finished Thursday a two-day seminar on security and human rights reporting sponsored by the European Union (EU). 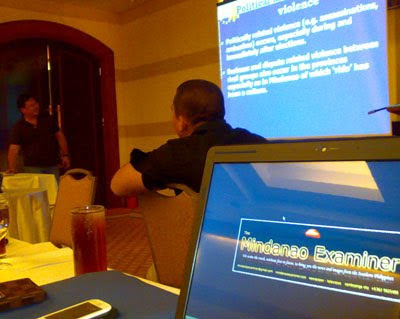 The seminar, held in Davao City, was part of the EU-Philippines Justice Support Programme (EPJUST), which aims to assist Philippine society in bringing an end to extralegal killings and enforced disappearances through technical assistance and capacity-building. EPJUST activities are designed to contribute to the effective investigation, prosecution and trial by the competent Philippine authorities of persons involved in any way in extralegal killings and enforced disappearances. 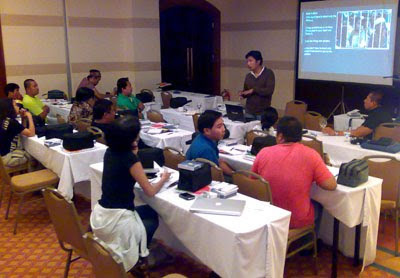 Joseph Erson Reyson, a technical security expert for EPJUST, spoke personal security and safety for journalists and advised them to take extra careful in their coverage of situation in Mindanao. Reyson cited the kidnappings by the Abu Sayyaf of a television reporter Ces Drilon in Sulu in 2008. Militants intercepted Drilon and her two cameramen Jimmy Encarnacion and Angelo Valderama, including their guide Professor Octavio Dinampo while pursuing an exclusive story about the Abu Sayyaf. Drilon works for the television giant ABS-CBN Broadcasting Corporation while Dinampo teaches Political Science at the Mindanao State University. They were released several weeks later after private negotiators reportedly paid huge ransom to the Abu Sayyaf. “Do not ignore unusual or strange circumstances, do not place self in situations to attract threat, understand or learn various cultural differences and sensitivities in the area where you resides, cultural awareness is also important for journalists who cover different areas in Mindanao,” Reyson said. Romina Santa Clara, EPJUST human rights expert, also discussed various subjects on human rights and other security issues. A case study she wrote in 2008 won the Europeaid Communication Award for Asia. The local strategy and tools on human rights mainstreaming she developed for the EU Delegation-Manila was also cited as good practice. Santa Clara, one of EPJUST three key experts, has about 20 years of experience in gender equality and human rights approach to development, involving field work with civil society organizations and national human rights institutions and working groups in the Philippines and Asian countries. EPJUST also invited veteran journalists Jason Gutierrez, of the Agence France-Presse; Alma Carpio, associate editor of Philippine Free Press and president of IT Journalist Association of the Philippines; and documentary photographer Jess Aznar. Many journalists who attended the seminar reported receiving death threats and intimidation from people affected by their news stories. But they still continue their job despite the threats. In 2009, at least 32 journalists were among 57 people brutally murdered in Maguindanao province in Mindanao in the worst political killing in the country. The journalists were accompanying a political caravan when they were stopped by some 200 gunmen who were allegedly followers of the powerful Ampatuan clan. In an April 2009 follow-up report to the United Nations Human Rights Council, UN Special Rapporteur on Extrajudicial, Summary or Arbitrary Executions Philip Alston observed that while the Arroyo government has taken some steps to address extrajudicial killings, it fails to implement needed reforms such as institutionalizing the principle of command responsibility. He also noted that the military has not changed its counterinsurgency methods to eliminate the likelihood of unlawful killings. At the end of the seminar, EPJUST distributed to journalists trainer booklets and video discs, including handbooks on human rights.